Science Olympiad Foundation (SOF) conducts National Science Olympiad (NSO) for all students studying from Class 1st to 12th. The Science Olympiad by SOF is conducted in two levels i.e. 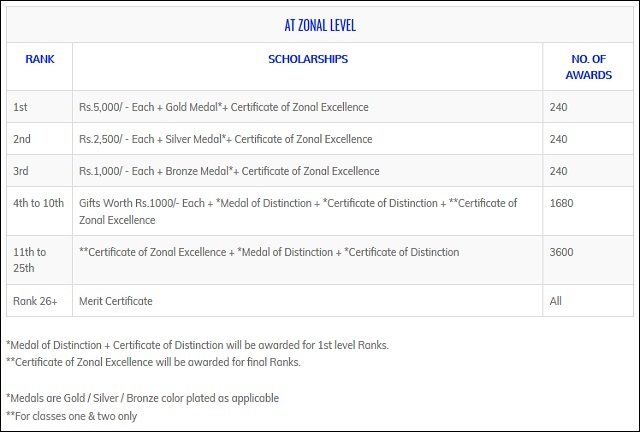 level 1 for Class 1st to 12th and level 2 for students who appeared in level 1 exam and are studying from Class 3rd to 12th. Students can participate through their schools (registered with SOF) only. In this article, you can know all about NSO 2018 including exam dates, eligibility, the syllabus, exam pattern for all levels as well as sample papers. All students studying from Class 1st to Class 12th are eligible to participate in National Science Olympiad by SOF. The schools interesting in representing their students for providing them with an opportunity to acknowledge their students’ talent can register with Science Olympiad Foundation for participating in the Olympiads. The SOF registration form 2018 is available on the official website in .pdf format for download and Schools need to fill it and submit at the official address by post. The participating schools can fill the registration form of SOF 2018 mentioning participating students’ data along with the fee of Rs. 125 per student. Number of Questions – 35 MCQs for class 1st to 4th and 50 MCQs for Class 5th to Class 12th. 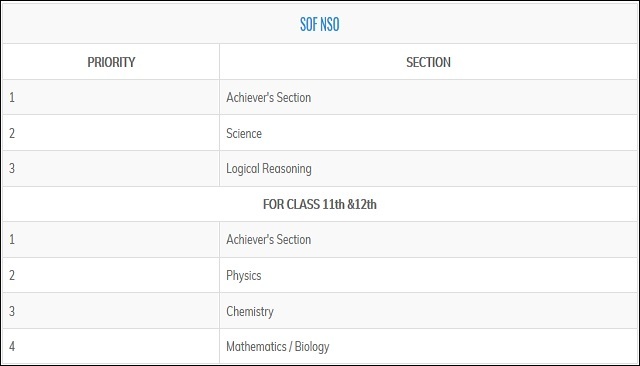 For NSO level 2, the question paper for all classes will be based on syllabus of current Class. Section – 1: Verbal and Non-Verbal Reasoning. Section – 2: Motion, Force and Laws of Motion, Gravitation, Work and Energy, Sound, Matter in Our Surroundings, Is Matter Around Us Pure, Atoms and Molecules, Structure of Atom, Cell-The Fundamental Unit of Life, Tissues, Diversity in Living Organisms, Why Do We Fall III, Natural Resources, Improvement in Food Resources. Section – 2: Crop Production and Management, Microorganisms, Synthetic Fibres and Plastics, Metals and Non-metals, Coal and Petroleum, Combustion and Flame, Conservation of Plants and Animals, Cell, Reproduction and Endocrine System, Force and Pressure, Friction, Sound, Chemical Effects of Electric Current, Some Natural Phenomena, Light, Stars and the Solar System, Pollution of Air and Water. Section – 2: Heat, Motion and Time, Electric Current and its Effects, Winds, Storms and Cyclones, Light, Acids, Bases and Salts, Physical and Chemical Changes, Weather, Climate and Adaptations of Animals to Climate, Fibre to Fabric, Nutrition in Plants and Animals, Respiration in Organisms, Transportation in Plants and Animals, Reproduction in Plants, Natural Resources and Their Conservation (Soil, Water: A Precious Resource, Forests our Lifeline, Wastewater Story). Section – 3: Higher Order Thinking Questions - Syllabus as per Section – 2. 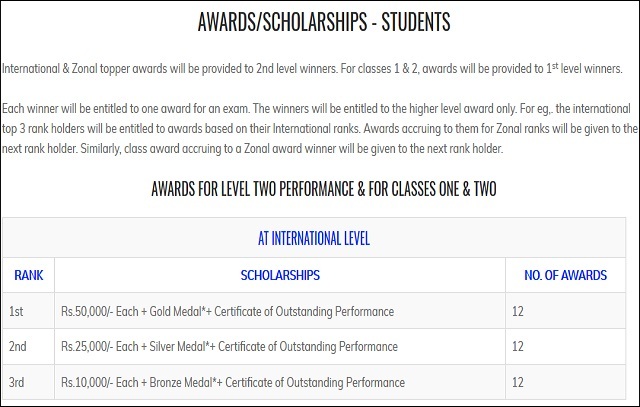 Top 3 students will be awarded Gold, Silver and Bronze medal respectively from each section of a class if more than 25 students appear for NSO 2018 for the class level. Certificate of Participation: All students will be given certificate of recognition for participating in NSO 2018 for both levels (separately).